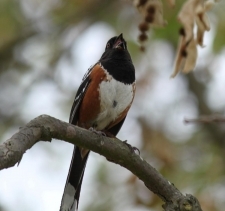 Towhees are very commonly heard before they are seen, noisy and busy scrounging up food. They love to forage on the ground in the undergrowth of the Laurel Sumac and Chaparral for seeds and small insects. They are intense birds when looking for food. They have a great scratching technique to uncover insects and seeds on the ground. They use a “double-scratching” method; it’s a two-footed backwards-scratching hop. If you’re trying to attract Towhees to your home feeders try sprinkling a few seeds on the ground. Some of my feeders at the house get some spill over and I’ll see Towhees below the feeders eating the fallen seeds. Spending a lot of their time on the ground they tend to hop wherever they go, moving deliberately always giving themselves the opportunity to spot food. 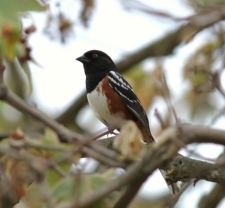 During conflicts between two Towhees, you may see one bird pick up a piece of twig, bark, or a leaf and carry it around. This may be an indication of submission and may find himself a need to move on. When alarmed or disturbed Towhees will flick and flash their wings while perched, letting the other Towhees in the area know that they’re not happy. 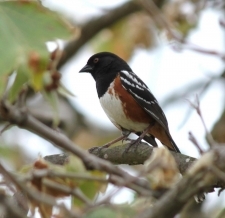 Spotted Towhees are members of the Sparrow family. They are year-round residents here in our east county and all of Southern California. Widespread and abundant their numbers have remained stable between 1966 and 2010, according to the North American Breeding Bird Survey. Partners in Flight estimates a global breeding population of 33 million with 79 percent spending some part of the year in the U.S., 23 percent in Canada, and 20 percent in Mexico. Nest building is the female’s job, she builds her nest with dry leaves, stems, bark strips, then lines it with an inner cup of dry materials such as grasses, pine needles, and hair. Nests are typically 4.5 inches across, with an inner cup 2.5 – 4 inches across and about 2.5 inches deep. 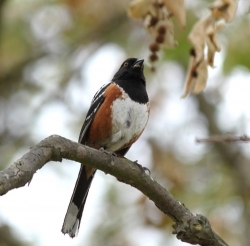 Towhees build their nests on the ground or near to it, although occasionally will build their nests a few feet above the ground. The typical nest is deep in the thicket and concealed very well. At least two broods, consisting of three to five eggs, are laid per season. The female does the incubating for 12 to 14 days, the young leave the nest at 10 to 12 days. Predators of the Towhees nest can range from raccoons and rats, snakes and even other birds, with the Cowbird being the main invader. I took these photos at Mission Trails Regional Park near the Mast Blvd parking lot. I find the trails are close to home and great for long or short hikes and if I have my camera with me, maybe a good nature photo or two. We are fortunate here in Southern California; lots of open spaces, good weather all year round, with one of the most diverse amount of birds in the nation. What more do you need for a short walk or hike in the outdoors.